5% discount on final price when combined with the Okavango Delta Ride 7 night stay in 2019. Off the beaten track adventure riding in the vast Makgadikgadi Pans and Thamalakane bush, a full service safari. Interact with meercats. 2019 Low Season: 12, 18, Jan; 1, 16 Feb; 6, 18 Mar. 2019 High Season: 11, 18 Aug. Riding Ability Required: Walk, trot and canter on a good horse, from intermediate onwards. Transfer: 2019: approx. £510 per person return light aircraft transfer, Maun - Camp Kalahari - Maun, payable at time of booking. Arguably the best ride in the world for good riders. Frequent big game sightings, fantastic riding on an unbeatable team of horses, luxury accommodation. 2019 Low season: January; February; March; December. 2019 Mid season: 1 April to 31 May; 1 October to 1 December. 2019 High season: 1 June to 30 Sept.
Trip Length: 6 days/5 nights, 8 days/7 nights or 11 days/10 nights. Riding Ability Required: Post to trot 10 min and gallop out of danger. Minimum age 12. Transfer: 2019: from £260 per person each way (helicopter). Road and boat transfers possible depending on flood levels - please enquire. 5% discount on final price when the 7 night Okavango Delta Ride is combined with the Makgadikgadi Salt Pans in 2019. 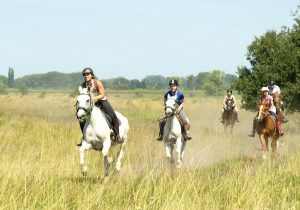 Mobile camp adventure in Okavango Delta, suitable for intermediate and experienced riders onwards. Low season: 5, 23 Jan; 9 Feb; 11, 23 Mar; 17 Nov; 1, 14, 22 Dec.
High season: 19, 26 Jul; 11, 23 Aug; 7, 15 Sep; 3, 11, 19 Oct. Shorter stays available all year round on request. For shorter stays low season is 1 Jan - 31 Mar and 16 Nov - 31 Dec; mid season is 1 Apr - 15 Jul and 1-15 Nov; high season is 15 Jul - 31 Oct. Transfer: 2019: Included from Maun airport for 7 night ride. For nightly stays transfers are 21 GBP per person return. Transfers are 30 minutes from Maun to the start of the ride. Safari for all levels of rider set in a luxurious lodge along the Thamalakane River near the Okavango Delta and Maun, a full service safari with riding adapted to the ability of the riders. All year round (high season 1 Jul - 31 Oct). Enjoy the beautiful colours in the mountains, the roses blooming, the fresh air and the fun riding through amazing landscapes and scenic villages with a discount of 100 EUR on the departures in MAY and JUN. 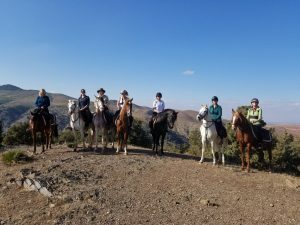 A week-long based stay with riding out around the Central Balkan National Park. Trips can be tailored to different experience levels and explore the pristine wilderness, meadows and mountains in Bulgaria. 2019: Available all year, Saturday arrivals. Transfer: 2019: Included from meeting point according to time of last arriving/earliest departing guest.